It’s been a fabulous few months for Tony Sheldon, the native Australian who stars in Broadway’s “Priscilla Queen of the Desert,” the musical based on the disco-infused movie about two drag queens and a transsexual who get a cabaret gig in the middle of the Outback. The actor, 56, recently received his green card, meaning that when “Priscilla” ends its run, he can stay in the United States to pursue more work. “Maybe something where I don’t wear a dress,” Sheldon cracked recently backstage at the Palace, where guests walk past hundreds of colorful costumes -- there are some 500 in the show -- to reach the veteran actor’s dressing room. He also was honored in May with a portrait at Sardi’s, unveiled and displayed on the walls of the Rialto institution. 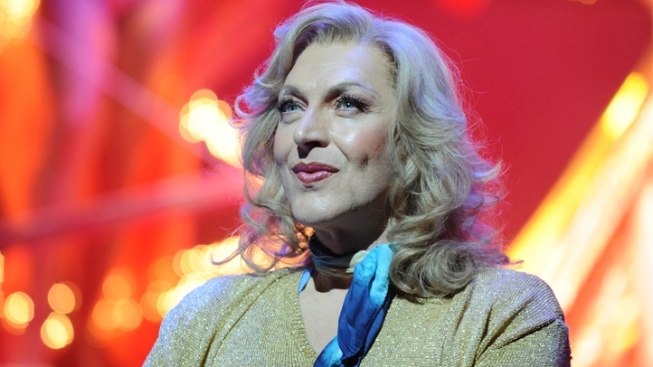 Sheldon created the role of “Bernadette,” a recently bereaved transsexual, in the first workshop of the show seven years ago and has starred in every “Priscilla” production around the world -- first, in Australia, then New Zealand, London and Toronto. His Broadway debut won him unanimous critical acclaim, and a 2011 Tony nomination. It got him thinking: perhaps it’s time to follow in the family footsteps and hang out on U.S. soil for a while? Sheldon is descended from a long line of stage performers. Mother Toni Lamond is a major musical theater star in Australia who also worked in Los Angeles for 20 years, after Tony was an adult. His grandparents were vaudevillians. His aunt, meanwhile, is Helen Reddy, singer of the women’s lib anthem “I Am Woman.” Reddy became an American citizen in 1966. For the longest time, Sheldon felt it was important to “fly the family flag in Australia,” where he starred in plays such as “Long Day’s Journey Into Night.” Then, “Priscilla” came along -- a big, gay musical set in Australia, with an Australian production team. It wandered around the world, with Sheldon the only actor from the original workshop starring in each successive production, until landing on Broadway last year under the watchful, cosmetically enhanced eye of producer Bette Midler. “The vehicle was right for me to come here,” Sheldon says. Last year, Sheldon approached an immigration lawyer, with his handful of nominations and awards (besides the Tony nomination, there was recognition from the Drama Desk, and the Outer Critics Circle, and the Theatre World Award for Outstanding Broadway Debut). The lawyer said he would try to get Sheldon a green card, but all the theater accolades in the world weren’t going to sway the federal bureaucracy. “The lawyer said, ‘Your application is going to somebody in Texas who knows nothing about showbiz. You have to justify 40 years of being a performer in another country.’” Sheldon also would have to show that if “Priscilla” ended, he could find other work. Sheldon embarked on a “data collection” project, requesting references from many of the directors with whom he worked in his 40 years on stage at home. He assembled glowing letters from new colleagues and friends such as Midler and Rosie O’Donnell. He got an agent. He got it. In January, Sheldon was backstage at the Palace, his makeup all done. A letter was delivered. It was just before curtain. On May 3, Sheldon was the guest of honor at the unveiling of his portrait at Sardi’s, accompanied by his “Priscilla” costars Will Swenson and Nick Adams. Sardi’s portraits are created by resident caricaturist Richard Baretz, from photos provided by the actors. Sheldon’s hangs between Stockard Channing and Patrick Page (“Spider-Man’s” Green Goblin). For the first time in the seven years since creating Bernadette on stage, Sheldon doesn’t know what will happen once “Priscilla” closes. Like most actors of his stature, he’s invited to do readings for prospective roles. The opportunity to stay in America, while a dream, presents a challenge on a personal level: his partner of 33 years, actor Tony Taylor, can’t stay here beyond July. A future here means a separation on that front.